AzhwAr says that when these people [jIvAthmAs] carry out kainkaryam in keeping with their nature, emperumAn also shows himself to them appropriately. avvaNNam Am – he transforms himself that way. thamar ugandhadhu evvuruvam avvuruvam thAne – whichever divine form his followers assume for him, emperumAn adopts that form itself as his, willingly. Isn’t he taking up various forms in his incarnations for the sake of his followers! SrI rAma tells the celestial persons in SrI rAmAyaNam udhdha kANdam 120-11 “AthmAnam mAnusham manyE rAmam dhaSarathAthmajam” (I am happy in considering myself as a human being, as the son of dhaSaratha). In SrI bhagavath gIthA 4-11 emperumAn himself says “yE yathA mAm prapadhyanthE thAmsthathaiva bhajAmyaham” (in whichever form my followers think of me and attain me, I attain them in archA (idol) form taking the same form). He says “I do not have friend or enemy. There is no compulsion that they should attain me only in this method. I attain them in the status that they are in, in the way that they hold me” SrI vishNu dharmam 103-16 says “surUpAm prathimAm vishNO: prasannavadhanEkshaNAm, kruthv(A)AthmAna: prIthikarIm suvarNarajathAdhibhi: ” (let him worship vishNu as an image made of materials such as gold, silver etc with a beautiful form, bright face, eyes etc which he desires). Thus it is mentioned [in several scriptures] that emperumAn’s divine form can be made with any material. Since some people [contemporary with him] only enjoyed when he took incarnations and others who came subsequently lost out on him, emperumAn keeping that loss in his heart, comes down in images or shapes that these [later-day] followers desire in whichever material they choose and worship him. Once when emperumAnAr (bhagavath rAmAnujar) had gone out [at SrIrangam] for bikshA (alms), little children who were playing on the street, scrawled a few lines on the sand with their legs and told him “here is your perumAL [emperumAn]” emperumAnAr immediately kept the vessel that he was having in his hands on the sand and did a sAshtAnga praNAmam (prostrated) to that figure on the sand (this would imply that whatever the children scrawled as emperumAn’s image, emperumAnAr also accepted that it is his image). thamar ugandhadhu eppEr maRRu appEr – it is not only form, but even in the case of his divine names, he accepts whatever names his followers give him. Leaving aside names such as nArAyaNa etc which are exclusive for him, he also accepts names given by his followers. 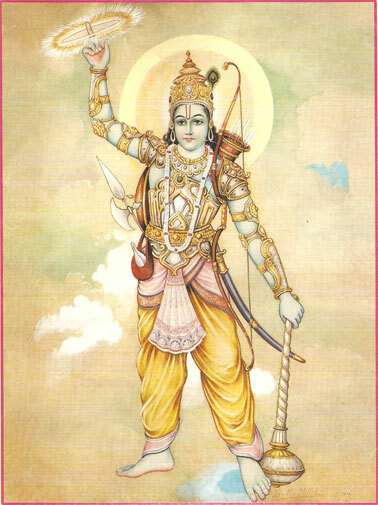 nanjIyar had given the divine name “Ayar dhEvu” to his thiruvArAdhanap perumAL. emperumAn, to show him that he relishes that name, appeared in the dream of engaLAzhwAn and demanded blue berries. When engaLAzhwAn wanted to know as to who he was, he replied “I am nanjIyar’s son Ayar dhEvu” Not only did he mention the name that nanjIyar gave him, but he also played by that name [Ayar dhEvu refers to krishNa, who was the lord of cowherds and liked blue berries very much]. Wondering at this, engaLAzhwAn told nanjIyar “your son is not allowing me to sleep. He keeps pestering to be given this and that”. thamar ugandhu evvaNNam sindhiththu imaiyAdhu irupparE avvaNNam AzhiyAnAm – he remains with the same qualities and activities that his followers think of and keep meditating on. The one who creates all the worlds and who controls everything, becomes the form, name etc which his followers desire and thus becomes created and controlled. Just as AdhiSEshan makes himself the way emperumAn desires of him, as said in the 52nd pAsuram of this thiruvandhAdhi “senRAl kudaiyAm irundhAl singAdhanamAm ninRAl maravadiyAm” (AdhiSEshan becomes emperumAn’s umbrella when he goes out, his throne while sitting and his sandals when standing), emperumAn also makes himself as the way his followers desire of him. While the followers carryout the tasks because of their SEshathvam (being servitor) emperumAn does all the things for the followers because of his love for them. AzhiyAn – though only sudharSana chakkara (the divine disc) has been mentioned, it is implied that the above would hold good for all nithyasUris (permanent dwellers of paramapadham). AzhwAr says that while there are many like sudharSana chakkara to carry out tasks based on his thoughts, emperumAn himself leaves them all and adapts in the way that his followers think of him and acts accordingly. nammAzhwAr says in thiruvAimozhi 3-6-9 “nenjinAl ninaippAn evan avanAgum nILkadal vaNNanE” (emperumAn who has the complexion of a large ocean, transforms himself into whatever his followers think of him). It is not only in form and name, but also in terms of qualities, activities etc that he goes by what his followers desire of him. We shall take up the 45th pAsuram next. This entry was posted in iyaRpA, mudhal thiruvandhAdhi on July 23, 2017 by T N Krishnan.